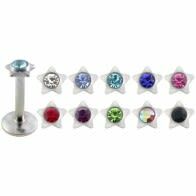 Our selection of internal Madonna labrets is one of the very best in our special piercing deals. Visit us and witness a range of sparkling, elegant and funky labrets that is designed to impress. Top notch quality, safe material and super smooth body, inventive and elegant designs and awesome color combinations make our labrets very much loved. Avail our jewelry for sale with discounted price. 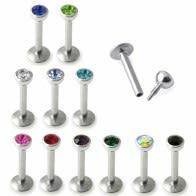 Labret piercing is considered a progressive, elite choice in the niche of premium body piercings. Labrets engaged attention due to their pop culture connection. During the 90s, they emerged as the sexiest, most attractive piercings. A Madonna piercing is essentially an upper lip piercing. Madonna piercings are typically found on the right side of the face. Labrets used here can be pierced vertically or horizontally. The most surprising aspect of Labret Madonna Studs and Piercing is that it is not as contemporary as some people believe it to be. History has that Ethiopia’s Nuba tribe and Mali’s Dogon tribe had lip piercings for religious purposes. The studs used today are definitely more progressive but the basic nature of the piercing remains the same. Today, Labrets have become more than just a new jewelry item—they are a way to express your individuality, flaunt a bold style statement. Some people associate Madonna Labrets with the 80’s era, a vibe that was unique and witnessed many fashion upheavals. However, it was during the latter half of the 80s and early part of the 90s that Madonna Labret Piercings were accepted as more mainstream type of body piercing. There is one aspect about Madonna Labrets that you need to understand. This is not about being subtle in your expressionism. Expect most of the labrets to be bold, including some eccentric designs. 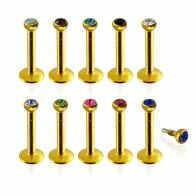 When you have reasonably good wardrobe selection but are struggling to grab attention, try the Madonna Labret Studs. 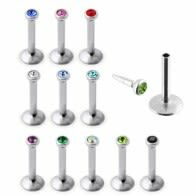 At Piercebody.com, expect Madonna Piercings Studs to be comfortable and safe to remain in your skin for a long time. 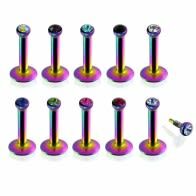 These studs are made of safe stainless steel—surgical-level steel that does not come with the issue of allergic reactions, corroding or causing infections. We have the biggest online inventory of hypo-allergic Madonna Labrets. 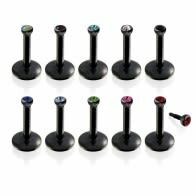 Expect your post-piercing process to be less demanding due to the use of premium materials. 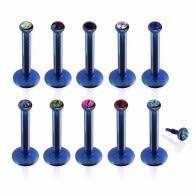 Find a variety of anodized, UV, Bio jeweled labret studs in a vast array of colors including rainbow, dark blue and more shades that are somewhat unusual but make a lot of sense. These are extremely popular among men and women. Why is Piercebody the preferred destination to shop for Madonna Labrets? 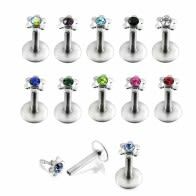 We offer body jewelry products with the highest quality and market-best prices. All our products promise purity and fit the international benchmarks of authenticity. Not just reasonable but also reliable, our product rates are shown along with accurate depiction in writing and image form, along with details of weights and sizes. Whether you like bold, trendy fashion pieces or elegant classics, we bring you an extensive variety without ever compromising quality. Our jewelry is practical enough to be worn every day and for all occasions.